I would say I’m happy, positive, easy-going and kind. It’s kind of funny thinking about it now, my dad had planted little seeds for me to be that way, which of course I didn’t realize at the time. Whatever yoga is teaching me today, my dad taught it to me first. Early on I learned some valuable lessons: not to think bad thoughts because once you do, you can’t take them back. Anger takes energy. Slow down, don’t rush through life. Be good to people. And be kind to yourself. Throughout my time in Sri Lanka, I’m always taking my time to make sure that everyone is okay. Whether you’re someone I just met or someone I’ve known for a while, I always want to make sure everyone is treated with kindness and respect. Aside from yoga, I love cooking. I love cooking for other people. Growing up, my father was ill and I thought I could cure him with food. I’d spend hours scouring the internet and researching books on ways to eat healthy. I’ve heard you like Ayurvedic practice, how did you get into this? During my first yoga teacher course I also learned about Ayurveda, which is a holistic system of medicine based in India. The base of ayurveda is to understand your own nature, and how to balance yourself according to your nature. We have so much impacting our life, from our external environment, to our inner thoughts and the food we consume. With so much going on, it’s crucial to find balance and happiness in this life. Your natures are also called your doshas and are comprised of the five elements on Earth. They are vata, pitta, and katha. Just as a quick example, vatas have a primary force of air and are often thin in nature and always moving. Kathas are more earth-based and are grounded, with a love to be at home. So you see I started to learn more about this concept and apply it to my own life. I developed it further to find out what worked for me. I challenged myself with my diet and thought processes and adjusted my lifestyle accordingly. What would you suggest to someone interest in learning more about Ayurveda? Seek out an ayurvedic practitioner to start and see where you’re at right now, and where you can go to become balanced. You can start by reading some of the fundamentals and experimenting on what feels good to you. The beauty of ayurveda to me is that you have all the tools you need within your own body. Our bodies are designed to heal themselves. Just as homeostasis works to maintain a certain level in our bodies, we can use ayurveda within the same way to create balance. I’ve been practicing yoga around 5 years. I think it’s really important to find a yoga teacher that can awake a sense of what yoga can do for you. Before I was teaching pilates, and went to a few yoga classes here and there but I wasn’t really all that interested in it. I decided to go to a yoga retreat in Mexico just to try it out and found a teacher that changed the entire way I thought about yoga. That feeling that she sparked within me made me want to explore the path more and more. It’s kind of addicting – once you feel it you just want to delve deeper. After that, I started to go to more classes and more studios back home. What do you think it is about yoga that drew you in? For me, I think it was the philosophy behind yoga. The physical practice is one thing, but I loved the universal truth I found in yoga. It’s all about how you position yourself in the world, how you deal with yourself, and using your breath as a way to guide you through it. I’m not nice, I’m normal. It’s a shame people consider me so nice because I feel that’s how everyone in this world should be. With yoga, I believe in it so much and the positive impact it can have, and I want to spread it to the world. Affecting just one person can make a difference. I think of it like a chain reaction – when one person is impacted, they can impact someone else, and so on and so forth. I may not be able to change the world, but I can change the world for one person. That’s the goal. I was in India last year and found myself really wanting to surf. It’s always been one of my life goals to tick off. Word of mouth about Sri Lanka and good surfing spread, and the more I heard about it the more I wanted to go. I decided to book a one way ticket and didn’t look back. Once I got here, I found Sunshinestories and Ceylon Sliders and a yoga community. I didn’t really have any expectations coming here. I’ve always traveled throughout my life and love finding the new in everything. I guess maybe I was expecting it to be similar to India because they are so close, but I found out quickly it’s a completely different world. I found the surf community to be a huge aspect of Sri Lanka. Everywhere you go everyone is talking about the surf and asking how the waves are, how long you’ve been surfing, if you’re surfing tomorrow, what board you are riding. All of it makes me feel like I’ve become a surfer myself. I’m from Russia, but I haven’t lived there in 10 years. I was living in Abu Dhabi for some time, working with an airline and teaching pilates and aerobics on the side. When I discovered yoga and practiced more I decided to become a certified instructor and began teaching. After 7 years of living there I decided to go to India. It was yoga and ayurveda that gave me the hope and confidence to seek happiness wherever I go. Have you always been this adventurous? If so, why do you think that is? I think I’m a world traveler in every essence of the word. I’ve been traveling as a young child. I think the more you travel, the less fear you have. The way I think of traveling and my life is like I’m on this boat on the river of life, and I’m just sitting there as it docks on little pit stops along the way. I just trust it. I trust the universe, I trust life. What does your day look like in Sri Lanka? I start the day by waking up at 5:55 on the dot – okay, well sometimes 6. Then, I join yoga at 6:30 for an early morning. A few days a week I also do yin yoga in the evening. Would you say you have a passion? Life is my passion. Every day I’m excited about what life is going to give me that day. I love everything that it gives me. All the ups and downs with amazing people are all the colors of life, the good and the bad. I wake up every day and I’m excited. 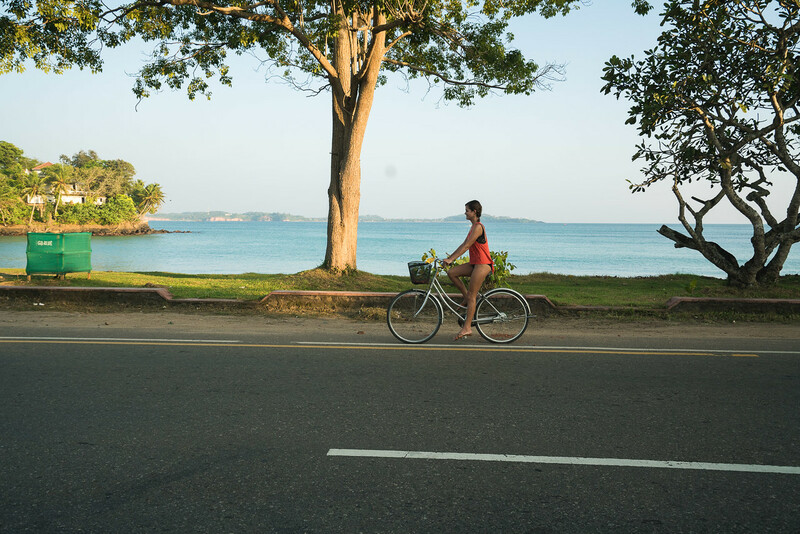 What’s your favorite part of being in Sri Lanka? Doing yoga because it gives me an opportunity to meet amazing people and to spread my love of yoga. To spread my love of yoga is to spread my love of life. What has been your favorite memory at Ceylon Sliders? We did a new moon event during the solar eclipse that was truly special. My whole journey with Ceylon Sliders has been nothing short of amazing. Describe Ceylon Sliders in one word. There isn’t really one word, but it is like my Sri-Lankan home. I spend most of my time here. It’s like my baby. If you have 10 minutes to go on a yoga trip what would you bring? Just a pair of shorts and a t-shirt. That’s all I need for yoga – something comfortable. What is your favorite item from the Ceylon Sliders shop? Coconut oil. I put it in my hair, I make a mask, I cook with it, I put it on my face, I eat it by the spoonful. *Valentin pays tribute to Vera’s father, a man near and dear to her heart, and subsequently ours for molding her into the bright light she is today.